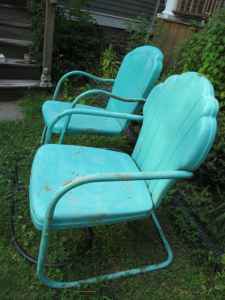 Two vintage garden chairs in the perfect color. I found them on Craigslist last night in the town next door. Yah??? That is what makes them great! They don't even match, he said. Thats what makes them even cooler, I said. They are going to look great with my turquoise umbrella. by looking at my old garden pictures. Can't wait to put these cool old chairs in the yard. Those chairs are going to look so cool in your lovely yard. What an amazing find! Great craigs list find. Men don't get it until, they see it or sit in it! They will look great in your yard, Amy! Love the color! Nice score! Love the chairs, love the color, oh I can't wait for warm weather! I have 2 of these I got last summer off craigslist but they are painted black. I am liking the turquoise. Great find! Love those chairs!!! Your yard is beautiful! omg, just look at your beautiful garden! those amazing chairs are going to be wonderful there! Love em! They are a great color, too. I found two a few years ago for $5 each but they were bright blue. We painted them green, but now I thinking they need a new color again. Visiting from Savvy Southern Style! Hi again. I just found my paperwork that was on the roll of wall paper and it says VG60707 RUN #7. If you google that it should come up. It actually has a brown background. Looks a little different that my blog shows. It comes with different colored backgrounds too. I bought it from Stevens blinds and papers on line. I think the chairs are wonderful, I love the color!! I never would have known that your Adirondack chairs were plastic. Very practical! Great chairs in a wonderful color! Those were a fun find! Your backyard is beautiful. Those are a great find! The most perfect color. I had a whole set of these that my Grandmother left me but when I moved to this house I left them for my sister to use since they didn't really go with this home. But I love those kind of chairs. My Grandmother's were painted cream....so I would have had to paint. That was really a lucky Craig's List find. I can't wait to see them in your garden. Yes, with your umbrella. Love your new chairs! Perfect color and what a great find! Oh Amy I am loving your chairs!! LOVE the color- how absolutely perfect!! Two different chairs paired together is fantastic~ I love that they don't match perfectly! They will looks great in your amazing yard!! I am thinking I need some turquoise in my yard this year- such a great color! I read your comment about my cupboards too. Yes, knotty pine walls are the backs- they are the kitchen walls. As for your newer ones~ of course...caulk is your friend lol! you could fill the holes if you wanted to to create a smooth interior- but what about just papering or lining with beadboard inside if you wanted one to be open? Amy, I love your chairs! I bought one at an auction last year and I love mine. I've been on the look-out for another but I haven't been so lucky so far. LOVE those!!! And, the whole backyard! Ooh, love these Amy! They are the perfect color. covet your back yard AND those amazing chairs. you have such a great style. can't wait to read more of your blog!! Those chairs are really cool and they will look great with your umbrella in your pretty garden! Great chairs and perfect colour! I love love that umbrella!!!!! Just viewed your beautiful home over at Sherry's! My favourite photo is of your adorable dogs!! Oh, yeah! Those are pretty doggone neat! Men. They just don't get it, do they? My husband has learned to just shrug and say OK. Actually, he's even come around a lot through the years and is beginning to get it. My grandmother had these types of chairs so when I found two (on seperate excusions) in people's TRASH I went and asked if I could take them. 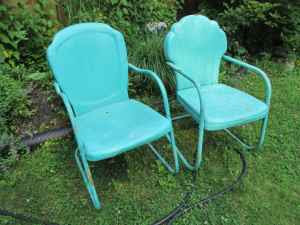 One is turquoise, the other I am stripping to repaint as it had rust spots. I love them! No plastic chairs here! I'd rather sit on the ground! Oh, I heart these chairs! A treasure found! I think you just made my heart beat a little faster with the outdoor pics and turquoise!!! that umbrella is so adorable- where did you get it? And the chairs are absolutely perfect. Seriously perfect! you are so lucky! Thanks for sharing this at Transformations and Treasures! That is one awesome find and oh yeah...they're gonna look great in your yard! Love those chairs! The umbrella is wonderful - where DID you find it?! I just love turquoise. I've fallen in love with your whole house!